Community Advocate, and Executive Vice President with the National Hispanic Media Coalition Inez González is one of Hispanic Lifestyle’s 2013 Latinas of Influence. 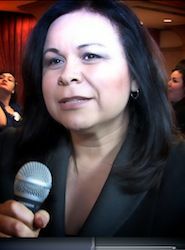 Inez González joined the National Hispanic Media Coalition (NHMC) team in 2005. In her tenure at NHMC she created the media policy program; opened the NHMC Washington D.C. office; developed a funds development program; and implemented internal operational systems that have strengthened the organization. Inez is now based in the NHMC Pasadena headquarters and functions as the chief operating officer. Previous to joining NHMC, Inez was the District Director for Congressman Bob Filner (D-51) overseeing the management and operations of two district offices that served over 650,000 constituents. Inez’ professional experience includes tenures as Public Relations & Communications Manager for a California Health Management Organization; and Contract Compliance Officer for the public transportation agency in San Diego, CA where she managed Equal Opportunity Programs for the agency. Inez is a fellow of Hispanas Organized for Political Equality (HOPE) Leadership Training Institute, the Women’s Policy Institute a program of the California’s Women Foundation, the National Hispana Leadership Institute (NHLI). She is a Board Member of the Center for New Community (CNC), a national organization committed to building community, justice, and equality; and the National Immigration Law Center (NILC), an organization with a mission to improve the lives of low-income immigrants. Inez has a Bachelor’s in Computer Science from the University of San Diego, a Master’s in Organizational Management from the University of Phoenix, and a Masters in Public Administration from the Harvard Kennedy School.